With exam marking and committee meetings, it has been a slow week, but here's a pop quiz. have to do with this video? (the video has a nasty crack at the end of it, and so don't watch if squeamish). The answer is not that the woman in the photograph is the girl in the video. Of course, what we are looking at here is a collision, and due to the use of the yoga balls, it is a pretty elastic collision, and so energy is almost conserved (and if you account for the energy that goes into heat and noise, it's completely conserved). But what we all remember from our high school physics is that the thing called momentum, the sum of mass times velocity, is always conserved in collisions, and so if, before the collision, we take the mass of the boy and multiply it by his velocity, and then do the same for the girl, and then add the two quantities together, this sum is the total momentum. If we do the same after the collision (assuming no external forces), the total momentum remains the same (this is why it is a conservation law). But you knew that. It still, however, leaves a question. Why is the sum of mass times velocity conserved? Why isn't the sum of mass divided by velocity conserved? Some of you will undoubtedly think this is a silly question, and the answer is "because a teacher told me so". This brings us back to the woman in the top picture. 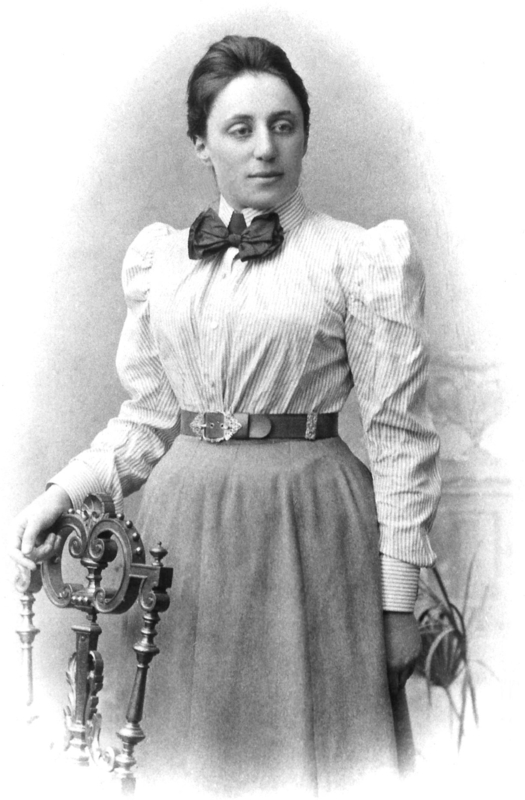 Some of you will recognise her as Emmy Noether, and she is one of the most important (and yet unknown) people in physics (even though in reality she was a mathematician). What's the link? Well, Noether discovered something amazing. She discovered that symmetries in physics give us conserved quantities. Without getting into the technical details, what she discovered is that if the laws of physics here are the same as the laws of physics over there (translational symmetry) then the quantity we call momentum (strictly linear momentum) must be conserved. Also, if the laws of physics remain the same if I rotate myself around (rotational symmetry), then we have a quantity known as angular momentum conserved. And, if the laws of physics are the same in the past and future as they are now (temporal symmetry) then we have a quantity called energy that is conserved. Ohh!! You might say, that's interesting. But then you might say that isn't energy conservation a bit obvious. I mean, clearly "energy cannot created or destroyed" is obviously true. After all, you were told it in school, and they would never lie to you.... would they. This is where it starts to hurt a little. Emmy Noether's original work on conservation laws considered a Newtonian universe, and Newtonian laws of mechanics. Things were pushed into 4-D space-time to accommodate special relativity and electromagnetism. This is cool as we now have quantities such as relativistic energy (and kinetic energy) which are conserved. Furthermore, there is a symmetry you can pull out, there is no change in the laws of physics is you shift the phase of the quantum mechanical wave-function, which implies that charge is conserved. The last one will, I'm sure, annoy some. Charge being conserved is obvious, electrons are little balls and charge is a little minus side painted to their point-like side. But alas, no. Without the appropriate symmetry, charge would not have to be conserved. In fact, symmetries in the quantum groups give us lot of other quantities which are conserved in interactions. Things get really hairy when we consider general relativity. Space-time in special relativity is the same everywhere and everywhen, and so we have the outcomes of physics experiments being the same and symmetries and conserved quantities we are happy with. 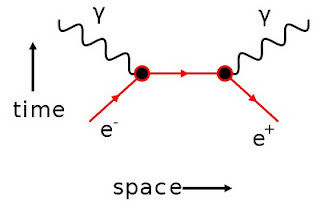 But in general relativity, the underlying geometry of space-time changes with position and time and so the symmetries we were happy with previously are gone, and so are the conserved quantities. The one that gets most people is the expanding universe and the loss of the time-symmetry; the space-time in the future will be different to the space-time now. No t-symmetry, no conservation of energy. Energy is not conserved in an expanding universe. Photons lose energy as they travel through the universe. Where does that energy go? The equations of relativity tell us; nowhere! Don't worry, energy is not conserved in an expanding universe. High speed masses slowly grind to a halt, as the universe expands, with respect to the the local environment. Where did all that energy go? Nowhere! Don't worry, energy is not conserved in an expanding universe. Don't just listen to me. Listen to Sean Carroll over at Cosmic Variance. Energy is not conserved in an expanding universe. I know some of you will not like this, as the conservation of energy is clearly obvious, and makes perfect common-sense. All I can say is that common-sense is a pretty poor guide to the last 100 years of physics.